Abstract—The optimization of Bio-SRF is conducted by mixing sewage sludge with waste sawdust and coffee grounds to improve high moisture content and low calorific value. grounds(1~5g).This study was aimed at put the sewage sludge(2~10g), waste sawdust(1~5g) and coffee grounds(1~5g) as variables using RSM (Three-dimensional analysis & Central composite design).The result is [sewage sludge(2.0g), waste sawdust(1.0g), coffee grounds(5.0g)] and 0.9872 as R-square(adj). Forecast data is reported 4,574.26 kcal/kg above the condition. Index Terms—Response surface method, waste biomass, bio-SRF, high calorific fuel. 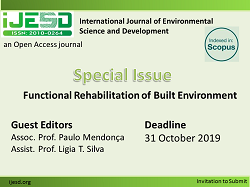 The authors are with Incheon National University, Development of Environmental Energy Engineering CO 22012, Korea (e-mail: 1905jo@naver.com, jyk071919@naver.com, whdmswll12@naver.com, lowellhyeon@naver.com, 21428msw@naver.com, whyeo@inu.ac.kr). Cite: Jin Kyung Jo, Yong Gyun Jin, Eun Ji Jo, Wan Soo Hyeon, Seon Woong Min, and Woon Ho Yeo, "Calorific Optimization Design of Waste Biomass Using Response Surface Method (RSM)," International Journal of Environmental Science and Development vol. 8, no. 7, pp. 474-478, 2017.